Nancy Greenleese has a very fine profile of Howard Spiegler for Voice of America. Mr. Spiegler has been an important advocate in a number of important art and antiquities restitution cases. Because of this great work he received the 2010 ARCA Award for Lifetime Achievement in Defense of Art. The audio profile includes highlights of Mr. Spiegler's remarks at the ARCA conference, as well as the comments of Chris Marinello of the Art Loss Register, and historian Marc Masurovsky. You can listen to the profile here. Nancy Greenleese, Fighting for Art Justice, Voice of America, http://www1.voanews.com/english/news/american-life/Fighting-for-Art-Justice-99225324.html (last visited Jul 26, 2010). "The Bulldog" Makes a Case for the Return of the "Getty Bronze"
Last weekend at the 2010 ARCA conference, Italian state attorney Maurizio Fiorilli offered his thoughts on the ongoing dispute between Italy and the Getty over the disposition of this ancient Greek bronze, often called the "Bronze Statue of a Victorious Youth". Fiorilli has been nicknamed "Il Bulldog" by the Italian press for his quiet persistence in securing the return of illegally exported and illegally excavated cultural objects from a number of American museums, including a number of objects acquired in recent decades from the Getty. One object which the Italians did not secure was this bronze, which is the subject of a seizure proceeding in Italy. I've posted below four videos which find Fiorilli making a reasoned legal case for the return of the bronze. An Italian court in February ordered the return of this object, however difficulty will arise when Italy attempts to convince a U.S. court to enforce the order. The Getty has appealed the Italian decision, but the legal proceedings are important not only for the direct result, but for the shift in public perception which the Getty will have to navigate. Surely the Getty does not relish the idea of a long protracted public debate over the disposition of this bronze. The story of this bronze presents an interesting case. Though it was certainly illegally exported from Italy, it cannot be considered a "looted" object in my view. The bronze was found by Italian fishermen somewhere in the Adriatic in the 1960's. I wrote a long summary of the story of the bronze back in 2007. 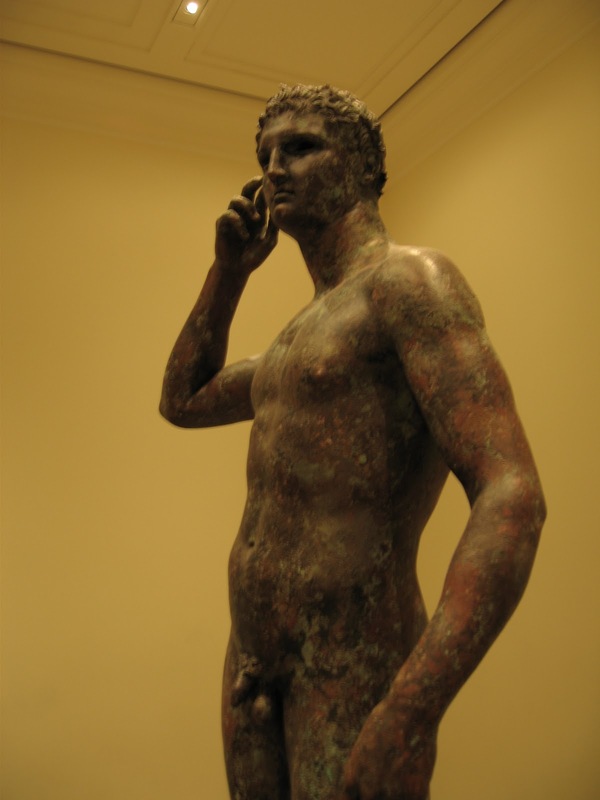 To summarize, the statue was found by fisherman in the Adriatic in 1964, smuggled out of Italy, and eventually purchased by the Getty in 1977. The bronze was discussed a great deal in the very public battle between Italy and the Getty over other looted objects in recent years. Yet there was a lack of direct evidence linking the Getty to any wrongdoing in the acquisition. Criminal proceedings were brought against some of the fishermen and handlers of the statue in Italy in 1968. Left with little concrete evidence to secure a conviction, the fishermen were acquitted. Yet as Fiorilli argued, these proceedings were made difficult because the actual statue had been smuggled abroad, and Italian prosecutors were unable to meet their burden. I'll let Fiorilli make his case in the videos below, and apologies for the low sound levels. Fiorilli spoke beautiful English, but chose to make his case in Italian, with the help of a translator. I have just returned from beautiful Amelia and the second annual Association for Research into Crimes against Art (ARCA) conference. Next year's conference will be held July 9-10th in Amelia. A call for papers and announcement will be posted here in the coming months. This year the conference was chaired by Founding Director Noah Charney and took place at Palazzo Petrignani at the top of Amelia—a grand setting for the discussion of art crime. 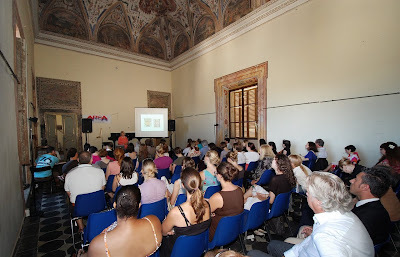 Though the Umbrian sun made the room quite warm at times, the two day conference offered a number of terrific presentations and discussions. I'd like to draw out a few highlights. Judge Arthur Tompkins delivered the first paper of the conference, discussing what he calls an International Art Crime Tribunal. Judge Tompkins made a compelling case for the tribunal at last year's conference, and in the edited Art and Crime collection. Judge Tompkins argued that we need a consistent and fair approach to these art disputes. He noted that a number of prominent nations of origin like Italy, Greece or Egypt might be initial eager proponents of such a Tribunal; and Rome would perhaps be an ideal venue for the court to sit. He gave a frank appraisal of the challenges such a Tribunal would face, but noted that the creation of such a tribunal warrants development. Much like the other international Tribunals and developments had their own champions, and International Art Crime Tribunal would need the same—the Universal Declaration of Human Rights was championed by Eleanor Roosevelt for example. Judge Tompkins discussed the ongoing dispute over Portrait of Wally, which has stretched on since 1998, comparing it to the Jarndyce v. Jarndyce chancery decision from Dickens' Bleak House. Perhaps a fair robust Art Crime Tribunal would be better positioned to resolve that dispute in a more timely manner. It was a position challenged however by Howard Spiegler, who was honored at the conference and who also acts as counsel for the successors of Lea Bondi Jaray, who owned the work before fleeing the Nazi's. Mr. Spiegler argued that none of these parties wanted this dispute to stretch on this long, and that much of the delay was a result of the discovery process which has been an effort to uncover the complicated history of this work since it left Ms. Bondi's possession. Yet Judge Tompkins responded by noting that the American system of long, protracted discovery does not always promote justice. It may in some cases, but it also leads to a soul-crushing existence for young lawyers. Though this research and work is handsomely compensated, it can in my opinion carry a lawyer far from the true practice of law. That of course is a more general critique, not isolated to the Wally dispute. Judge Tompkins noted that if a legal system ties the proper adjudication of a claim to one piece of paper or one exchange that may be lost, how can we ever decide a claim? We are left with an endless search for that one piece of evidence, while the core issues lay unresolved. Though no thinking person would deny the losses during the Second World War, there must be limits to these claims, and we may also consider the loss to the public of a beautiful work of art for nearly 12 years. Perhaps a Tribunal might allow for future claimants like the Bondi's to pursue their claims, while also allowing for the continued movement of works of art and allowing present possessors to achieve some measure of repose. 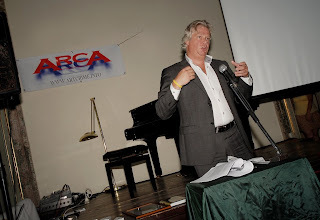 There were a number of other fine presentations worth mentioning. Betina Kuzmarov used the dispute of the Qianlong Bronze Heads from the Yves Saint Laurent collection to examine the difficult nature of using objective and subjective standards in cultural property disputes. Kristen Hower highlighted the importance of histories and proper acquisition of objects by discussing the dilemma faced by art historians in detecting forgeries in Late Antique art, specifically a number of objects known as the Cleveland Marbles. Chris Marinello discussed the work of the art loss register, pointing out that the ALR has ceased to offer certificates for certain antiquities searches, as the database is unable to effectively determine if these objects have been recently looted from their archaeology. Jane Milosch discussed the Provenance Research initiatives at the Smithsonian. Jennifer Kreder and Marc Masurovsky discussed nazi-era spoliation claims from the perspective of the holocaust claimants and their successors. 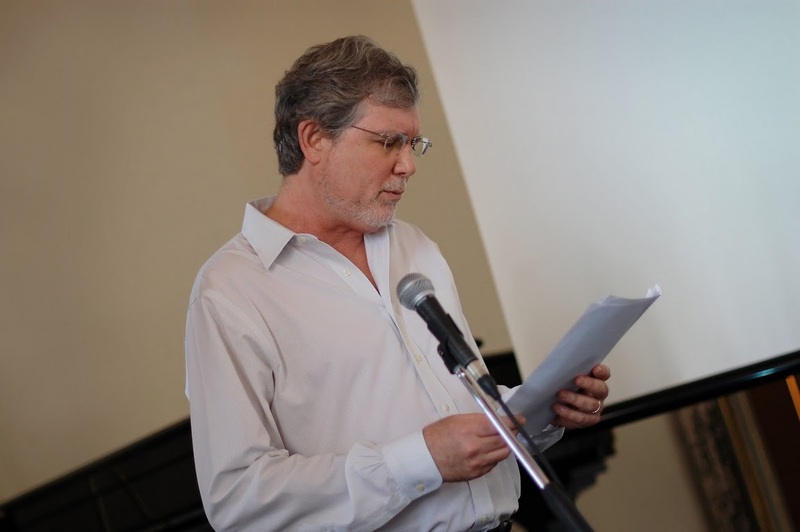 James Twining discussed his own use of art crime in his popular fiction. Valerie Higgins discussed the ways in which armed conflict and identity can be remembered and created. A number of participants and graduates of last year's ARCA MA program presented their work as well. Olivia Sladen discussed the importance of due diligence in the art market as it relates to forged works. Riikka Kongas discussed her work at the Valamo Art Conservation Institute in Finland, discussing the plague of forged Russian icon paintings which are discovered when they are brought in to be conserved. Catherine Sezgin offered her research on the 1972 theft at the Montreal Museum of Fine Arts in 1972. John Vezeris discussed the work of his company, Annapolis Group International in protecting the works of the historical San Lio church in Venice with Venice in Peril and ARCA. Colette Marvin analyzed the recent string of art crime exhibits being offered by museums in the United States and Europe. Charles Hill was unable to attend, but was presented the award for Art Policing and Recovery. Next up I'll discuss the comments of Giovanni Pastore, former Vice-Commandant of the Carabinieri Division for the Protection of Cultural Heritage, as well as the comments of Stefano Alessandrini and Maurizio Fiorilli, Italy's Advocate General, both of whom had some interesting comments on the loss of antiquities and on the ongoing dispute over the Bronze Statue of a Victorious Youth currently on display at the Getty Villa. Photos of the Conference courtesy of Urska Charney. On Tuesday, June 28, the interior minister of Ukraine announced the recovery of a painting by Caravaggio that had been stolen on the night of July 31st 2008 from a museum in Odessa, Ukraine. The thieves had out-smarted an antiquated alarm system by removing a pane of glass from the window, instead of breaking it. Once inside the Museum of Western and Eastern Art, the thieves, members of an Organized Crime syndicate, had sliced the canvas off of its stretcher, and disappeared into the night, without tripping a single alarm. An original Caravaggio can fetch upwards of $50 million at auction. But though the thieves were almost certainly unaware of this fact, the stolen “Caravaggio” is a fake. To be precise, the Odessa Taking of Christ is a contemporary copy of Caravaggio’s original Taking of Christ, which is in the National Gallery of Dublin. The Odessa copy was proclaimed an original by Soviet historians in the 1950s. But a 1993 article by art historian Sergio Benedetti proved what anyone who is familiar with Caravaggio’s work could see from looking at the painting—it was a good, contemporary copy. The figures, particularly that of Christ, are different (and less refined) than Caravaggio’s normal work. The easiest comparison is to juxtapose the Dublin and the Odessa pictures. The Dublin picture is lighter, and yet more brooding, and the figures are sharper. While an original Caravaggio could fetch $50-100 million at auction, a contemporary copy will bring in six figures, perhaps low seven. While that’s nothing to sneeze at, it is highly unlikely that the thieves knew that they were stealing a copy, worth less than 10% of an original Caravaggio. Caravaggio’s technique was revolutionary. No one in Rome had painted with the naturalism he did, particularly in religious works. Caravaggio also popularized a technique called chiaroscuro, the painting of light emerging from darkness, so that figures gradually and dramatically emerge from an amorphous black background. While religious institutions often deemed Caravaggio’s work “indecorous” (read as: it didn’t look like they expected it to), a passionate group of important private collectors launched Caravaggio’s fame in Rome in the first decade of the 17th century. Artists had never seen work like Caravaggio’s, and they flocked to Rome like pilgrims to learn from him. But Caravaggio was a violent, and thoroughly unpleasant man. He got in a fight with a waiter over an over-cooked artichoke, and killed a member of a rival street gang, ostensibly over a game of tennis. Unlike almost every other great artist of his time, he did not have a studio nor take on apprentices. In fact, he threatened to kill those who emulated his style. This didn’t stop him from being the most-frequently copied artist of his time, in both exact reproductions of his paintings, and in artists appropriating his signature style. The so-called Caravaggisti, among whom the painter of the Odessa Taking of Christ no doubt numbered, were a generation younger than Caravaggio, emulating his style and, in some cases, directly copying his works. It is of interest to note that the original Dublin Taking of Christ was first believed to have been a copy by one of the Dutch Caravaggisti, Gerrit van Honthorst, before it was correctly attributed to the master himself. According to police and criminologists, the Ukraine is rife with Organized Crime, with the Balkan Mafia particularly active. Their history of stealing art for trade or collateral in deals for drugs and arms suggests that this latest theft is another that can be attributed to them. They almost certainly, however, do not read art history publications like Burlington Magazine, which published the 1993 article proving that the Odessa Taking of Christ was a copy. So, is the last laugh on them? Are the under-educated Mafia undone by their own lack of research? Unfortunately for poetic justice, no. The thieves are not the only ones who may have missed the Burlington Magazine article. Most people think that the Odessa painting is an original—especially if they believe most world newspaper articles, which reported that it is an original Caravaggio worth $100 million. It seems that most newspaper reporters did as little research as the thieves. Among other criminals, the thieves can present newspaper clippings “proving” that their stolen Caravaggio is original, and simply ignore those who might point out its inauthenticity. 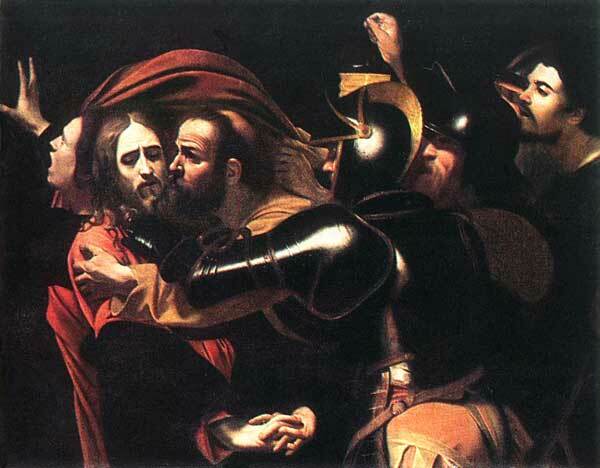 Though The Taking of Christ has now been recovered, the coda to the story of the Odessa “Caravaggio” remains mysterious. Police only reported that the organizer of the crime had been murdered in 2008, leading to speculation on who it might have been. According to information received by WM (Weekly Mirror) from sources close to the Ministry of the Interior, state law-enforcement agencies have recovered the Caravaggio painting “The Taking of Christ, or the Kiss of Judas.” The painting was stolen from the Odessa Museum of Western and Eastern Art in July of last year...According to several sources, the organizer of theft, who has been under investigation for several months, was found dead. Three days later, on 9 December 2008, another article linked the death of the organizer to the recovery of the painting: “According to unconfirmed information, the organizer of the theft was found murdered several months ago.” This statement would place the murder of the organizer of the theft soon after the July 31st theft itself. Or does another murder, one which corresponds to the recovery of the stolen painting, shed more direct light on the organizer of the crime? The question of the identity of the murdered crime organizer remains undisclosed by police. But Nikolai Ponomarenko is a strong possible candidate. Viktor Razvadovskii, the chief of police for the Kharkov region, has announced that a valuable painting has been found in the home of the murdered art collector Nikolai Ponomarenko, but that this painting “is not a Caravaggio,” the Ukrainian newspaper Today reported. The find has been sent off for an examination of its authenticity and value. The subject of the painting, which depicts sheep, has nothing in common with the subject of the stolen masterpiece. On a few matters, the available facts seem to agree. Organized crime was behind the theft of The Taking of Christ. Ponomarenko’s murder was linked to stolen art. The organizer of the theft, perhaps Ponomarenko himself but certainly someone linked to him, was murdered following the theft. Ponomarenko was involved in the illicit art trade, as a buyer if not an organizer. Black market “specialists” assert that oligarch-mafia men have paid at least 100 million dollars for the painting and are hiding it from the public gaze in their apartments. Their professional colleagues at the museum suggest that in this case we are dealing with a premeditated, commissioned crime... So, it is most likely that the treasure is sitting in the private collection of some sort of oligarch whom the detectives will never reach. Last Tuesday, 28 June, Anatoly Mogylyov, the interior minister of Ukraine, announced that German and Ukrainian police had recovered the Taking of Christ and had arrested members of an organized crime group that specializes in high-value thefts of items that include artworks. The group had intended to sell the “Caravaggio” in Berlin. It is incredibly rare to find a case in which a private collector commissioned the theft of artwork for their private delectation. Far more often, organized crime gangs steal art on the assumption that they will be able to find a buyer—and the failure to locate the elusive criminal collector results in gangs holding on to art that they have been unable to sell. This example is a case in point—an organized crime group stole the painting but failed to find a buyer and, around two years later, they still retained the stolen painting. The mention of certainty that “oligarch-mafia men have paid at least $100 million for the painting” tells us that the thieves were able to convince at least someone that The Taking of Christ is by Caravaggio, when the rest of the art history world knows that it is not. Were there any question of the painting’s value, the thieves need only have brandished any of the international newspaper articles that blazed headlines “$100 Million Caravaggio Stolen From Odessa,” to provide their proof of its value. World newspapers wouldn’t lie, would they? Probably not, at least not intentionally. But they would allow their enthusiasm for a hot story to impair the diligence of their research, effectively handing Organized Crime $100 million, when the actual value of the stolen painting was likely less than 1% percent of that figure. Even yesterday’s New York Times article reporting on the recovery of the “Caravaggio” failed to mention that the “Caravaggio” is not, in fact, a Caravaggio. Journalists, it seems, can be an art thief’s best friend. “The Kiss of Christ was Returned to the Odessa Museum” in Novoe Vremya, 12/9/08. All translations by Joel Knopf.